Please have a look at examples of research below, to better understand the reasons for including specific ingredients in Rested Legs. Efficiency / Convenience: Combining six ingredients that when taken alone, indicate a level of effectiveness, into a single product, makes consuming the ingredients far more efficient and convenient than the alternative of ingesting the same ingredients individually. 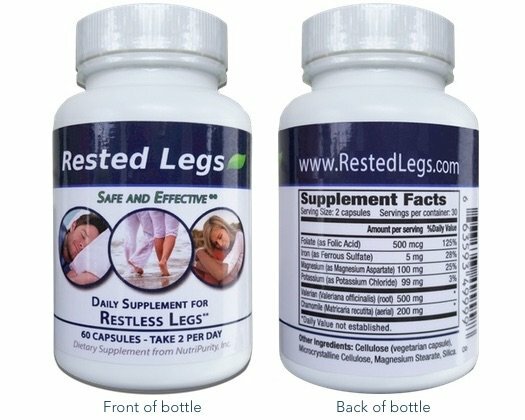 Low Cost: The cost to the consumer for a single bottle of Rested Legs™ is far less expensive than purchasing supplement products that contain each single ingredient. As with any dietary supplement, individual results may vary. Consult with your healthcare provider or pharmacist if you have questions or concerns that may be unique to your physiology.